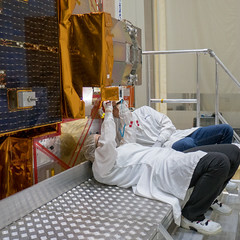 Today, Sentinel-5P was loaded on the Antonov aircraft that will take this latest Copernicus satellite to Russia to be prepared for liftoff in October. Sealed in its special protective container, the satellite was taken by lorry from Airbus Defence and Space in Stevenage, UK, to Stansted airport where it was carefully loaded on to this huge cargo aircraft. The photos here show just how huge this plane is. ESA’s Sentinel-5P project manager, Kevin McMullen, bid farewell to his precious baby – though he will see it again when he re-joins it at the Plesetsk Cosmodrome in a couple of weeks.